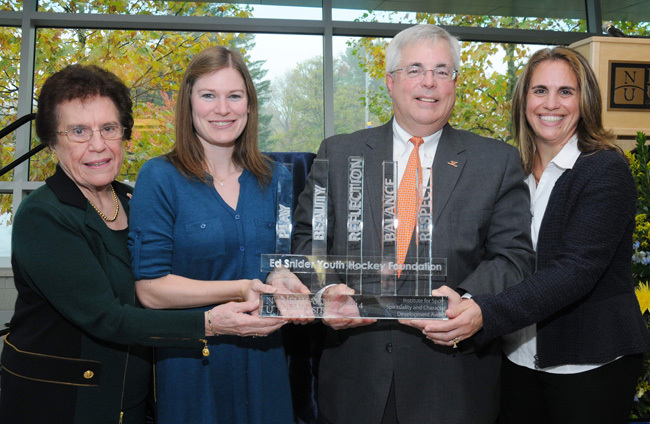 At center, Snider Hockey’s Jim Britt and Kathy Hanrahan accept the 2014 Neumann University Institute for Sport, Spirituality and Character Development award from Dr. Rosalie Mirenda (left), Neumann's president, and Lee DelleMonache, director of the institute. The Ed Snider Youth Hockey Foundation received the 2014 Institute for Sport, Spirituality and Character Development Award from Neumann University Nov. 6 in a ceremony held in the Mirenda Center on the Aston campus. The Institute Award recognizes individuals and organizations that exhibit strong character through athletics, exemplify spirituality and embody the good that exists in and through sports. For the first time, thanks to an anonymous donor, the Institute Award was presented this year in honor of the late Bishop Joseph McFadden, a longtime friend of the university. Bishop McFadden served the Archdiocese of Philadelphia and the Diocese of Harrisburg until his death in May 2013. Since its founding by Philadelphia Flyers owner Ed Snider in 2005, Snider Hockey has provided equipment, ice time and experienced coaching at no cost to children who otherwise would not have the opportunity to participate in hockey. More than 3,000 children from Philadelphia and Camden, N.J., participate annually. children to value academic and personal development by emphasizing the importance of schoolwork, mutual respect and good citizenship. He also cited the leadership of Snider, chairman of Comcast-Spectacor. “Whenever Mr. Snider sees me, he always asks two questions: how are the kids and what more can we do?” Britt said. Past recipients are Anne Donovan, head coach of the WNBA’s Connecticut Sun and Olympic gold medalist (2013), the Philadelphia Chapter of Coaches vs. Cancer (2012) and Keith Primeau, former captain of the Philadelphia Flyers (2011).